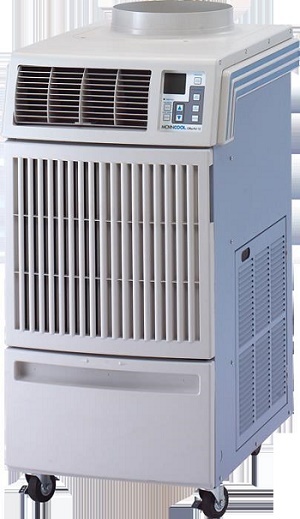 Searching for the right portable room air conditioner can be a frustrating task when you can’t seem to pick and choose the right manufacturer, model type, and price range. This guide will cover what you need to know so you can make the right purchase for your household. Remember, portable air conditioner units are meant to provide spot cooling as opposed to a central circulation system. They’re perfect for small apartments, single rooms, and substitutes for central A/C units. Don’t let the size of these units fool you, they can pack a punch and can provide a significant amount of cooling to any room or building. Prior to making an impulsive purchase, you’ll want to do some comparison shopping to ensure that you get a reasonable rate for the product that you’re interested in. Be sure to check with the various manufacturers like MovinCool or any other leading-name brands before you commit to one company. This will provide you with the variety of options that you need to make the right choice. Many times, shoppers will become enticed by the loaded features that units have and buy it on the spot thinking it’ll be used in the future. It’s important to remember that the more features a unit possesses, the higher the cost will be. Keep this in mind when you’re looking at various models. Do you need a simple spot cooler or something that incorporates more features? Narrow down what you need for your home or apartment room so you can maximize the use of the money that you’ve put in to purchase it. previous articleIs an Identity Theft Thief Watching You? next articleWhat Is Expected Out Of A Candidate For Accounting Manager Positions?